Bernini had been invited to Paris as part of a larger diplomatic exchange between the Papacy and France. The ostensible reason for the visit was to create new designs for the Louvre Palace, but the young king Louis XIV had declared he also desired a portrait bust. Bernini’s designs for the Louvre did not go down well and were not acted upon; indeed their failure to be accepted was a reflection of the general antagonism between the Italian Bernini and certain members within the French court. However, the portrait bust, which depended upon a more personal relationship between the king and the artist, was completed and largely considered a great success. 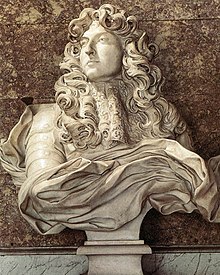 The creation of the bust is incredibly well documented, thanks to efforts of the French diarist Paul Fréart de Chantelou, a steward at the court of Louis XIV, who befriended Bernini during his time in Paris. The bust took just over three months to carve. According to Chantelou's diary the process of selecting marble suitable marble blocks took several days to accomplish. While searching for a suitable block of marble to create the bust there was some discussion with members of the court about whether or not Bernini would make a full body statue or a bust. Once potential blocks of marble had been selected, Bernini began by taking drawings (none of which survive) and small clay models of the king. However, it seems that once he had done this initial work, Bernini chose to work only during sittings with the king. His pupil, Giulio Cartari, began work on carving down the chosen block of marble (and would later do much of the drapery work), and then Bernini took over, taking forty days to complete the work. He had hoped to have twenty sittings with the king during the final carving process, but in fact there were thirteen of around one hour each. The bust is modeled heavily after an earlier bust that Bernini made almost a decade prior of Francesco d'Este, the duke of Modena, and other than the fact that Louis' cloak was slightly longer horizontally a person would not be able to tell that one was of higher nobility. 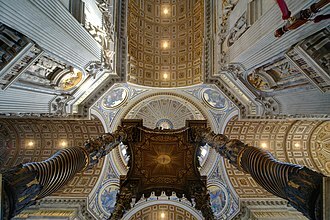 Bernini's son and biographer, Domenico Bernini, noted the artistic arguments of his father as to why the King agreed to sit for such a length of time, explaining that the artist preferred to work from Truth (i.e. real life) rather than rely on the unnecessary imaginative extras that would creep into working from sketches. Equally, Bernini wanted to see the king, as he did many of this other sitters, not remaining immobile, but sitting and talking in such as way that Bernini could capture all his characteristics. Such an approach, with Bernini wishing to capture the figure in physical and psychological motion, was a common element of Bernini’s work: “mere resemblance is inadequate. One must express what goes on in the heads of heroes,” Bernini is recorded as saying. Bernini also observed the king in other locations - playing tennis, resting after lunch, or simply walking around court. Filippo Baldinucci (biographer of artists/art historian) records numerous events that advertise Bernini’s supposed influence on French culture, including one incident where Bernini’s rearranged the King’s hair to give greater exposure to the King’s brow - the new stye was apparently followed by all at the French court, and became known as the Bernini modification. 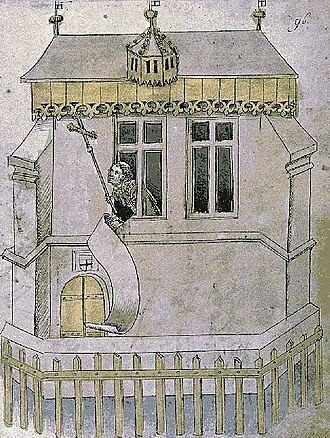 Contemporary art historians are sceptical of this however; Jeanne Zarucchi claims that the alteration was deliberate, altering the shape of the King's head in an unflattering manner. Sculpted late in his career, the bust’s grand nature, with its dramatic drapery and regal nature can be seen as a continuation of the bust Bernini executed for Francesco I D’Este. Despite not being an actual military commander, Bernini conceived of Louis in armour, drawing on notions of heroic kings such as Alexander the Great. Though a small man, Louis is figured as a stately character, fusing grandeur with a rich elegance of spirit. The drapery suggests the movement of wind, but also demonstrates the ability of the king to overcome such earthly distractions - he stares in to the distance, perhaps as if giving a military commands, turning his face against the direction the wind is blowing. Bernini may also have explored concept of Louis as the Sun King in the portrait, relating the king’s hair to sunbeams and the drapery as passing clouds. Yet the idealisation of the king as a great emperor was also grounded in reality. It was a feature of Bernini’s sculpture that he could combine abstract notions such as grandeur and nobility with precise individual characteristics of the sitter. Bernini paid careful attention to and played with the hair, eyes, nose forehead, and the clothing of Louis making subtle adjustments that allowed Bernini to give the appearance of the individual sitter, being without it being a slavish copy or a lifeless abstraction. To strengthen the military grandeur of the bust, Bernini designed a large globe to act as a pedestal for the bust, thus giving the appearance that the entire world was a platform for Louis’s majesty. Bernini also intended such a pedestal to raise the overall height of the artwork, so that the artwork would sit above and be out of touch of the spectator. However, this was never completed and the bust was moved from its position in the Louvre palace to the Palace of Versailles in 1680s, where it still remains now. Despite the carping of French critics at the court of Louis XIV, the bust was immediately considered a success, as the number of reproductions testifies. A mould of the bust was made in 1666; by 1669 at least seven plaster casts had been created. An early bronze version was taken to Quebec, Canada but is now lost. The only other early copy in bronze is in the National Gallery of Art in Washington. ^ Desmas, Anne-Lise (2009). "In Search of Marble in Paris for Gian Lorenzo Bernini's Bust of Louis XIV: A Letter from Charles Perrault to Jean-Baptiste Colbert". Getty Research Journal. No. 1: 169–178 – via JSTOR. ^ Zarucchi, Jeanne (Winter 2006). "BERNINI AND LOUIS XIV: A DUEL OF EGOS". Source: Notes in the History of Art. Vol. 25 No. : 32–38 – via JSTOr. 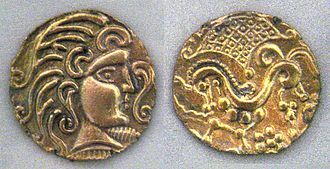 ^ Wittkower, 1998 15, points out that there is resemblance between the bust and Alexander as portrayed in surviving coins. ^ a b Wittkower, Rudolf. "Bernini's Bust of Louis XIV." Oxford University Press. 1951. The Bust of Alessandro Peretti di Montalto is a portrait sculpture by the Italian artist Gian Lorenzo Bernini. Executed in 1622 and 1623, the sculpture is housed in the Kunsthalle Hamburg. Although possibly mentioned by one of Berninis early biographers, the bust had been considered lost, the bust was identified in the 1980s and is now considered an authentic work by Bernini. But the precise reason behind this bust is unclear, given that Cardinal Montalto died in 1623, it has been suggested the bust was created as part of a funerary tomb. However, Montalto may well himself have commissioned the bust prior to his death The bust was recorded as being in the Villa Montalto in the early 1660s and in the Casa Peretti in 1682. The bust arrived in Hamburg Kunsthalle after 1910, being donated as part of the collection of the Anglo-German Sir John Henry Schroder, although only recently re-discovered by art historians the sculpture is well appreciated. Hess comments that the expression of thought and concentration on the cardinal. According to the 2008 census, the population of the city is 88,641 inhabitants, down from a peak of 94,145 in 1975. 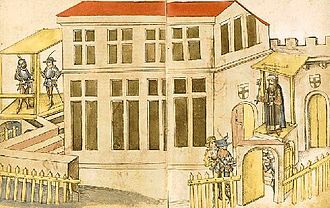 A new town, founded by the will of King Louis XIV, it was the de facto capital of the Kingdom of France for over a century, from 1682 to 1789, before becoming the cradle of the French Revolution. 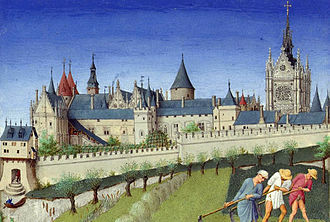 After having lost its status of city, it became the préfecture of Seine-et-Oise département in 1790, of Yvelines in 1968. Versailles is historically known for numerous treaties such as the Treaty of Paris, which ended the American Revolutionary War and this word formation is similar to Latin seminare which gave French semailles. 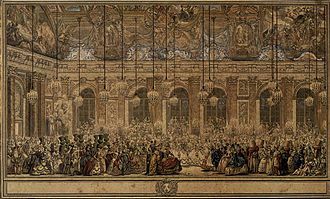 From May 1682, when Louis XIV moved the court and government permanently to Versailles, until his death in September 1715, during the various periods when government affairs were conducted from Versailles, Paris remained the official capital of France. Versailles was made the préfecture of the Seine-et-Oise département at its inception in March 1790, Versailles was made the préfecture of the Yvelines département, the largest chunk of the former Seine-et-Oise. At the 2006 census the Yvelines had 1,395,804 inhabitants, Versailles is the seat of a Roman Catholic diocese which was created in 1790. The diocese of Versailles is subordinate to the archdiocese of Paris, in 1975, Versailles was made the seat of a Court of Appeal whose jurisdiction covers the western suburbs of Paris. Since 1972, Versailles has been the seat of one of Frances 30 nationwide académies of the Ministry of National Education. Versailles is an important node for the French army, a tradition going back to the monarchy with, for instance, the palace of Versailles is in the out-skirts of the city. Versailles is located 17.1 km west-southwest from the centre of Paris, the city of Versailles has an area of 26.18 km2, which is a quarter of the area of the city of Paris. In 1989, Versailles had a density of 3, 344/km2, whereas Paris had a density of 20. Born out of the will of a king, the city has a rational and symmetrical grid of streets, by the standards of the 18th century, Versailles was a very modern European city. The Bust of Pope Gregory XV is a marble portrait sculpture by the Italian artist Gian Lorenzo Bernini. Executed in 1621, the work is one of three busts of the created by Bernini—the other two were bronze casts. The marble bust is on permanent display at the Art Gallery of Ontario and it was donated to the museum by Joey and Toby Tanenbaum. Bernini began work on the marble bust immediately after the election of Pope Gregory XV in February 1621, two bronze casts were made during this time. He was able to achieve this by reusing the pattern and arrangement of the cope and alb he had created for the Bust of Pope Paul V in 1618. 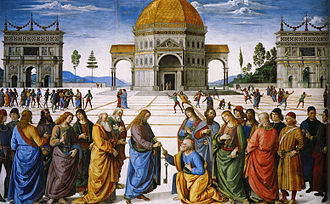 For this work, he only a few minor changes to the flanking images of Saint Peter and Saint Paul. As a result, the busts of the two pontiffs closely resemble each other. In both, Bernini nestled the head low into the cope collar creating a triangular silhouette, Bernini was well rewarded for his efforts in creating the Bust of Pope Gregory XV. On 30 June 1621, at the age of twenty-two, Bernini was awarded a knighthood by the pope—the Supreme Order of Christ—and an accompanying lifetime salary. In 1622, Ottavio Leonis engraving of the portrait was published showing him wearing the special cross of the order. Thereafter, Bernini was commonly referred to as Il Cavaliere, Bernini was honoured at this time by being elected the principal of the Accademia di San Luca, the artists society in Rome, after being a member for only three years. 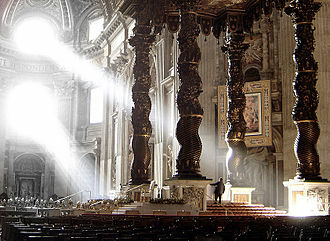 Along with the great mythological statues he executed in the Villa Borghese, Bernini used the cope—with its gold threads, stiff formal embroidery, and jewelled morse—to convey the power and wealth of the Church. The flanking panels depicting Saint Peter and Saint Paul show the popes saintly protectors, Bernini shows the thickness of the fabric and the rigidity of the embroidery by the abrupt bends with which it conforms to the curve of the popes shoulders. The popes head is bowed as if weighed down by his cope, symbolic of the weight and responsibility of his office and his eyes are raised, creating soft wrinkles across his forehead, his gaze is steady and far-reaching, focused beyond the viewer toward eternity. The view from beneath the baldachin, showing the Holy Spirit within a radiant sunburst. Bust of Louis XIV, by Gian Lorenzo Bernini (1665). The Journal describes in detail the gestation of this marble bust of the King. This is one of the few portraits for which Louis XIV agreed to pose: he allowed thirteen sittings. A closer view of one of the Children teased by the Faun. Closer view of the faces of the Faun and two of the Children.